It was not long ago that the concept PYT, drew ‘huh?’ from blank perplexed faces. Today, it might just be a hip term to suggest that you have been to the Singapore Art Museum’s Annex space, 8Q. PYT, short form for President’s Young Talent is a state endorsement to “showcase the work of upcoming Singapore artists whose work is both promising and exciting, and deemed of high enough standard to represent Singapore at International Art Fairs and platforms”. Started in 2001 with an eager stable of 9 artists, the biennial event had included designers, that have since spawned President’s Design Award, now run by the Singapore Design Council. Historically, this event was seen to be Singapore’s answer to Britain’s Turner Prize, in a lesser media glitz manner. Tate Britain’s website states: “The Turner Prize is a contemporary art award that was set up in 1984 to celebrate new developments in contemporary art. The (£40,000) prize is awarded to ‘a British artist under fifty for an outstanding exhibition or other presentation of their work in the twelve months preceding’.” The difference is, the PYT nominees are judged on their newly commissioned works, while the Turner is judged on their works in the 12 months preceding. The galleries were suitably proportioned for the 4 artists. Donna Ong’s Dissolution is the centre piece, consisting of layered acrylic sheets that separate mulberry-paper like cut-outs of trees, rock and cranes typically found in traditional Chinese ink paintings. Painted in a similar fashion that emphasizes the brushstrokes, wide tonal values and atmospheric perspective, the layers are compacted visually by a surveillance camera. The surveillance cameras are linked to three corresponding screens that flatten the layers into the three video images, each featuring a different detail of the large panorama/scroll. What you get, is a clever visual experiment with perspective, a visual remix of the Western single-point perspective represented by the ‘gaze’ of the camera, and the atmospheric, spatial treatment in traditional ink paintings of mountains and ravines. As one peers anxiously at these screens, nothing changes; a stasis that is rather zen-like, a calming contrast to the bustle of roaring traffic in the city, or bombardment of mass media that surrounds us. Dissolution, here, refers to ‘the action or process of dissolving’, the disintegration of perspective and scale. The illusion of 3D space created by perspective is questioned. This flattening could allegorically symbolise the merger of points of view, or ways of looking. This is consistent with Donna Ong’s interest in inward looking themes and objects, not unlike (a lot younger) Louis Bourgeois. The dissolution, on a grander scale symbolises the melting pot of cultures, technologies and sciences. The scrutiny and critique of a reproduction of a Chinese landscape also suggest the need for us to examine our own roots and culture. On another level, it questions ‘ways of looking’ begging us to uncover our layers of mis/understanding of knowledge. In a darkened passageway with the hum of a Machine, reminds me of E.M. Forsters The Machine Stops (1909). Objects are arranged like mushrooms, or spawns of spores along two long, parallel shelves. On closer observation, with whatever available light, these objects are assembled from nuts and bolts, screws and such. Something so metallic is made organic, like scientific specimens presented for examination. Except that one can barely keep one’s eyes opened. The sting to the eye, caused by chemicals released from freshly painted wooden constructed panels, almost seems deliberate. In another darkened space, towers made from an elaborate arrangement of glass/crystal vessels are lit in a mirrored hollow in the wall. These vernacular dioramas seem alive, with the soft glow that dims and brightens like breathing. One might recall the crystal palace of Superman, or the grandeur of The Crystal Palace in Sydenham Hill in the Victorian era. The fragility and transparency of the materials used here is crucial to an interpretation of the work. Resembling high-rise buildings in urban cities, they seem to have a foreboding message of over-crowding, alienation or destruction of the natural habitats (thus absent in the work) we take for granted. There is a performative and social aspect, often undermined by the confusing visuals in Felicia Low’s work the Stimulus and the Conversation. The space is incredibly homely, but at the same time, only like a showroom. Human interaction complete the space. Community art, or ‘new genre public art’ credits Joseph Beuy’s belief that anyone can be an artist, and the social dimension of the process of artmaking is arguably more important than what goes on show eventually. The conversations, which are recorded are evidences of self-discovery, are presented as audio clips one can listen to at a communal table. It is most certainly non-visual, opposite to any grand illusion of the master artist. Conversations, speech, the written word are important elements in Felicia Low’s work. One almost always feel like watching a documentary, discovering the social function of art in society, beyond pretty things that go on walls. Felicia Low has worked with different social services in her own capacity and in her collaborative artworks. Like Rirkrit Tiravanija, the purpose and function of the artwork unravels only with the participation of the audience. For Felicia Low’s new work to stand out, one has to disregard any finished pieces/artworks. Everything will be unfinished, unpolished. Everything however, will be an artefact, a seed for other ideas which the participants will take with them. The Art potential here, is not just the stimulus of a conversation with the artist, or amongst participants. Here, it is about sowing ideas; it is a place to leave one’s baggage at the door, let art-making be a distraction before galvanising the courage to re-examine family, life and our priorities. The work by Chor Leng reminds me of Matthew Ngui’s You can order and eat delicious popiah (1997), and Lim Tzay Chuen’s impossible projects. But this is not a parody of their work. Visually, Lifeblood is stunning, pumping water from the Singapore River from the gallery to the courtyard installation. The outdoor installation is best seen at night, when the soft green sinister glow illuminates the courtyard. The complex arrangement of tanks reminded me of a scene both from the book and from the movie, The Hitch-hiker’s Guide to the Galaxy (2005). Not in the strict visual resemblance, but a overwhelming sense of Bureaucracy, flowing from one tank/department to the other. Of course, the artist intended to tell the audience the process involved, with a booklet in the gallery detailing the email exchanges between government officials, the curator and the artist. We are informed that piping the water from the Singapore river would be possible, but not economically viable. So unlike Lim Tzay Chuen’s impossible proposal to move the Merlion to Venice Biennale, the Singapore River, the lifeblood of the nation, did have a slim chance of being the symbolic lifeblood of 8Q. For those of us unfamiliar with the significance of the Singapore River will belittle this gesture. Maybe pumping newater from somewhere to somewhere would have done the same, only with less algae. In the gallery, the placement of a large tube-tank is successfully minimal. For us old enough to remember Ghost Busters, the green tank resembled ectoplasm, bubbling like radio-active industrial waste. Placed next to the tank, is a flight of steps. The industrial steps that lead to a tap, and the text “You are in control” is deceptive, as nothing happens when one turns it mischievously. The water runs, albeit slower, as the brass pipes roars and vibrates for that instance. It puts people in their place. We are not in control, it seems. In the context of the museum, it seems to question the tussle of artist or art institution as the deciding factor for what art is. The position of power lies beyond simple steps and a tap. 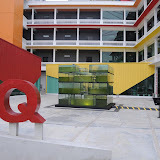 The work has visualised the complexities of decision making, and utilized the 8Q’s courtyard effectively. The whole event created by Vertical Submarine, an artist collective is intriguing. It is more art-like than Phunk Studio, yet slightly situationist to pin it down as installation, or performance art. Semiotics study is played out extensively in A View with a Room. Titles, images/references are all interlinked and than un-signed. Playing with the common hotelier or bed and breakfast phrase “A room with a view”, this is subverted to “A View with a Room”. This is only evident if you look through a peephole in the wall (Bet you didn’t see this), to find a curious grey-scaled room. After a Narnia-like journey through the cupboard, along a corridor stuck full of paper, you will emerge in a tiny room, where objects are carefully suggested, painted, and in some cases, halved. The walls seem to balloon, enveloping half the sofa and television showing Battleship Potemkin (1925) . There is a soft evening artificial glow from the ‘window’, and a sense of being stuck in time. The choice of grey scale is both dream-like and sterile. The attention to detail is playful and astounding. One can almost feel that the Vertical Submariners have spent more time on their work, with their powers combined, compared to the other individual artists. The work spells unlimited fun with language, and the potency of imagination and imagery are of the same epitome. The survey takes about 5 minutes. This survey ends 2359hr, Oct 31, 2009. The average score, out of 5, given by the participants of the survey. This is fun AND funny! I LOVE VERTICAL SUBMARINE’s work! its awesome. i visited it a while ago and just HAVE to goggle it again. its awesome awesome x3. i love how it is put together, the mood as one enters the room and the thrill to exit a wardrobe, enter a passage way that feels as though you left something behind…only to find a greyscale room and enter through another wardrobe door. The clock ticks backwards, the furnitures are halved as though stuck in transition, every book is in grey and white, even correction fluid is in black and white.! P.S: i discovered a post-it with blue lines though…=) awesome nontheless. I love your article on PYT! I visited the exhibition late last year with a HCAEP classmate and his roomate and we were completely awed by the works, but most of all, by Vertical Submarine’s. I DID NOT SEE THE PEEPHOLE. 😦 But we did find the hidden room and I had a mini heart attack from the skeleton in the closet hur hur. I’m doing my A-Level Coursework this year! I think I’m going to work with paper as a medium again.